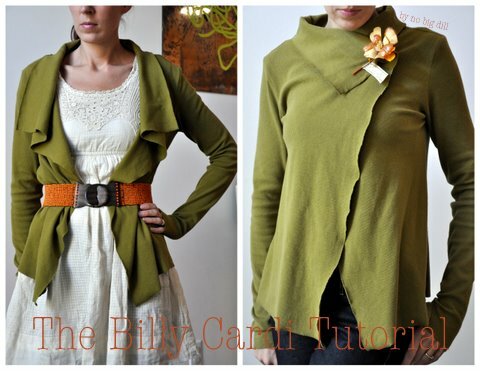 no big dill: Billy Cardi Tutorial: It's Fall! Billy Cardi Tutorial: It's Fall! I need to confess. There is something that fellow seamstresses might be shocked to learn about me. There. I've said it and I will own it, because as much as you'd think I would love to sew Halloween costumes, I don't. There are definitely some I enjoy constructing more than others. Like a theme. I love me a good theme, especially when it involves the whole family, but there are opinions contrary to my own around here now that they're getting older. So, we'll see if I even do any Halloween-related sewing this month. BUT! Now that we are well into Fall (at least those on this half of the hemisphere), I thought it would be a good time to re-post my Billy Cardi tutorial I did for Shannon from Luvinthemommyhood's Knits vs. Sews she did last year. I may sew up a few of these this month. They are truly very simple and ridiculously comfortable, warm and versatile. Give 'em a go! I'm gloved and ready for my time in the ring! Thanks for letting me duke it out here at luvinthemommyhood today. I never knew my cardio kickboxing VHS would actually come in handy for using my uppercut, thanks Billy Blanks. What do the sews have that the knits don't? The ability to snip here and there without redoing the whole thing: raw edges, of course! So I thought we sewists could use that to our advantage in this piece. Not only raw edges, but inside out seams. Whoa. We're getting crazy over here! What I chose as my muse? Ribbed knit. Ribbed knit is so stretchy and forgiving and COMFY! For the decorative stitching [more on that later] I used Sulky thread which you should not use for seams as it is a very weak thread, but provides some shine to your stitches. I used a shade darker for even more of a statement, but you can certainly use the same thread as your seams if you'd like. This might hurt as you do it and cause great anxiety, but you're going to put WRONG SIDES TOGETHER for the shoulder/neck seams. Stitch with a very slight zig-zag [as in you can barely tell.] This seam allowance will be visible on the outside of the garment. Trim seam allowance to 3/8" on both sides and use a decorative stitch on the very edge. Test this decorative stitch on a scrap! Trust me, those decorative stitches are torture to remove. Trust me. Really, just trust me on this one. I chose a blanket stitch [#9 on my machine.] But I also increased both the length and width of my stitch to the maximum to make it a big stitch. I would suggest not using a plain zig-zag stitch, though. We want it to look homemade in a good way. Next stitch the sleeve cap in with RIGHT SIDES TOGETHER in the arm hole. No need to do a double basting stitch on the sleeve cap. Just pin in place and stretch it to fit. Your final stitching will be the sleeve, keep your needle in the "down" position at the armpit, pivot and stitch the side seam. Repeat on other sleeve/side seam. All other edges are left raw and provide some nice draping effects. You can wear it belted and open. and those extra long sleeves? So comfy and warm. I love how the decorative stitching looks like a faux epaulette. Who doesn't love an epaulette? You up for the challenge, knitters? me too! Love to sew, for most holidays even! Halloween...not so much. I don't know why the holiday bothers me so much, but it does. My kids still get costumes and candy...but they have more store bought elements that hand sewn. CUte cardi! You look adorable in the photo shoot! I too dread Halloween sewing. I am all about buying the costumes or borrowing them. We don't do Halloween here either! but I LOVE fall and this is such an AWESOME fall cardi!! I cant wait to make several!! I think my little girls may get a matching set too! Thank you so much for this quick and easy tutorial. I am scared to try challenging sewing (as in I have NEVER done sleeves, they scare me!) but you make this look so simple I WANT to do them! Thank you!! I am your newest follower! can totally relate on the halloween thing. i was somewhat eager to sew my older two a little red riding hood and big bad wolf costume. but they vetoed my idea (at only 4 and 6!) and want a pirate and a mermaid costume instead. ugh. can i admit i've been looking online for them? in my defense, i do have a fourth baby due any day! Count me as another who dislikes Halloween. I dislike being expected to create and amazing costume that will get 2 hours worth of wear. If I'm going to spend a bunch of time making something, I want it get used. A LOT. I despise sewing Halloween costumes! It is just too stressful. Two of my children want to be Angelica and Blackbeard (from Pirates of the Caribbean- which they have not seen but are just obsessed with pirates). No way am I making 2 costumes with long coats! Luckily I talked them into buying costumes at the store. They look cheap, but I feel so relieved knowing I don't have to make them! Love this cardi and I'd love to have a go. Photos are GREAT! Thankfully we don't make much of Halloween in the UK - we'd never heard of trick or treat when I was young... but it is getting more popular now. i grew up in Australia, where halloween is not a big thing at all. so it's not really something i love either. my husband who grew up here loves it. i love this cardigan it is on my list of things to make for sure. Super cute! I'm going to have to give it a try! I didn't make this last fall and I really wanted to! Must. Make. It. This. Fall! WOW this is eerie. I have been hunting for an open front, light weight (menomania over here) cardi. I open and find these wonderful instructions and I'm makin a list for the store! I may have to dye the ribbed knit, our little store only carries white and ecru. I'm a fall/winter in most aspects. I so enjoy the natural beauty and colors of fall not big on Halloween either. Thanks again for the great instructions and your color choice is scrumptious!! Those boots are gorgeous - what make and model are they? I am always SO glad when Halloween is over! I love the comfy look of that top! ~Heather-The boots were purchased last year in NY, so I don't know the model, but they are Miz Mooz brand. Glad to know I'm not the only one who dreads Halloween sewing! Oh boy I am so glad it has been said.....I don't like it either.....now I love the holidays and I love fall but somehow halloween just does not do it for me at all...I don't have babies so it makes it a little easier...but even when I was little I didn't like it I always wanted to be something I could not be..mum would say " look in the encyclopedia for something you want to be " I would then she would hand me a sheet and scissors.. *#!%#$^&*(*&^%$ ( the scribble over my head ) I'm 7 how can I make this sheet into that damsel !!! so there you have it!!! it is out!!! Oh I love love love the Billy Cardi T !!! Thank you!! Ah! This is one of my favorite tutorials. I made a light weight jersey version in the spring... and now that you've posted it again, I think I want to make a new one in a heavier knit for the cooler weather! I love this tutorial, so much so that I'm going to link to you on my blog, Curious Visions, I hope you don't mind. If you do, drop me a line and I will remove it immediately. I'll be making dozens of these cardi's I'm sure.